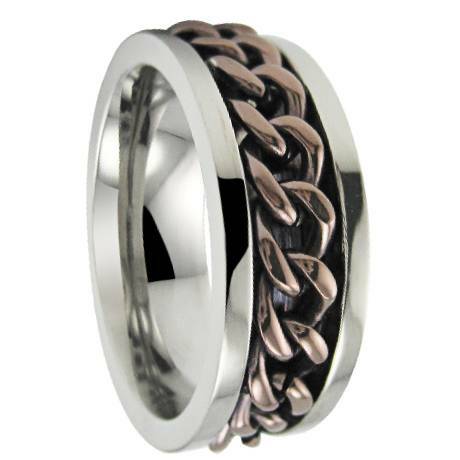 An unusual take on the two-toned ring, this men?s stainless steel ring features a bronze-colored stainless steel chain in the center of two polished steel edges. 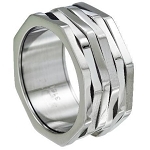 Ruggedly classic in its sculptural appearance, this traditional fit 8mm ring is the perfect fit for any man's hand. Great ring very happy with it, quality is 5 Star. Awesome ring Love it. Smooth curved edges and it spins! The ring fit great, and it spins easily. The color is a little more brown than the bronze I was hoping for, but my husband LOVES it! Great price, and shipped fast!